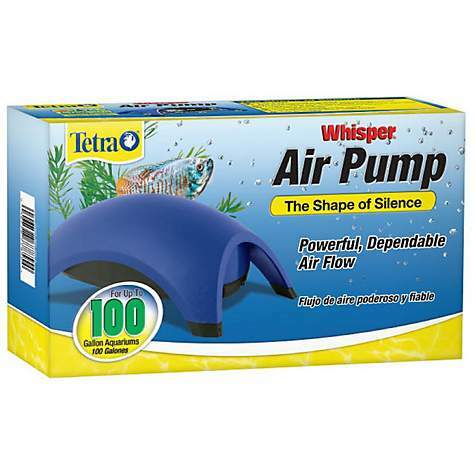 What Size Air Pump for a Fish Tank? 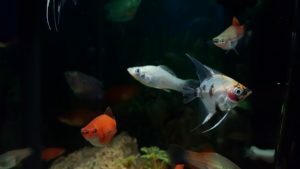 A simple rule of thumb for selecting the right size air pump for a fish tank is that the air pump should have an output of at least 0.033 liters of air per minute per gallon of water. For example, if you have a 55 gallon fish tank you will need an air pump that has an air output of 1.8 liters/min to properly oxygenate the water. To find out the right size air pump for your fish tank try out the aquarium air pump size calculator located at the top of this article. There are also other factors that play a role in how large of an air pump you will need for your aquarium. 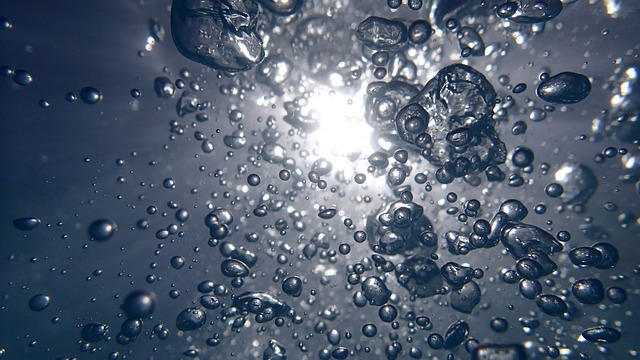 Water with a high temperature can reduce the amount of oxygen that can be dissolved in the water. Conversely low water temperatures will increase the amount of oxygen that the water can hold. If you plan on keeping a saltwater aquarium you will also have to consider getting a larger air pump. Saltwater has about 20% less oxygen solubility than fresh water at most temperatures. Because of this you will need an air pump that has a higher output to get the same dissolved oxygen levels. 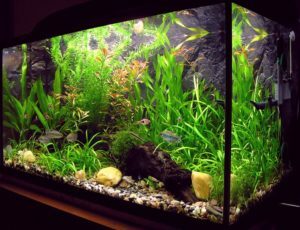 Planted tanks on the other hand will need less aeration, and in some cases you might want to forgo and air pump altogether. The reason for this is because planted tanks need to have a high CO2 level. When you run an air pump it forces the CO2 out of the water, which can be detrimental for plant growth. If you do choose to run an air pump on a planted tank, choose one with a lower output in order to minimize surface agitation. 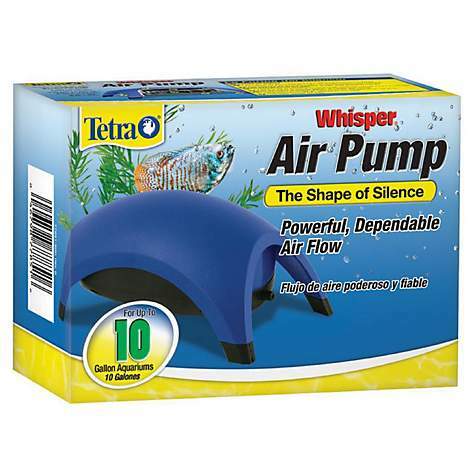 What are Air Pumps for in Fish Tanks? 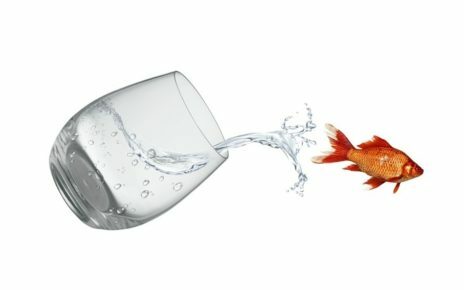 What do Air Stones do for Aquariums? What Size Air Pump for a 2.5 Gallon Tank? What Size Air Pump for a 3 Gallon Fish Tank? What Size Air Pump for a 5 Gallon Tank? What Size Air Pump for a 10 Gallon Tank? What Size Air Pump for a 30 Gallon Tank? What Size Air Pump for a 55 Gallon Aquarium? What Size Air Pump for a 75 Gallon Tank? What Size Air Pump for a 100 Gallon Fish Tank? What Size Air Pump for a 200 Gallon Aquarium? Is an Air Pump Necessary for an Aquarium? The most utilitarian reason an air pump is used is to either oxygenate the water or to aid in filtration. 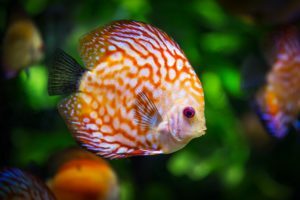 While providing oxygen to the fish might be one of the most important things an air pump is used for it’s not the only reason why people use air pumps with their fish tanks. Some filters like undergravel filters or sponge filters rely solely on an air pump to provide their pumping power. These filters rely on the Venturi effect to circulate the water throughout the aquarium. Water is either pulled through the gravel or the sponge media by the force of the rising air bubbles. 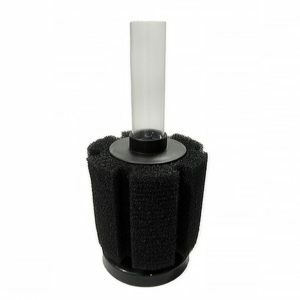 These types of filters are very useful in situations where more powerful water impeller driven filters can not be used. One such case is in breeder tanks where small fry could be sucked up into an impeller filter. 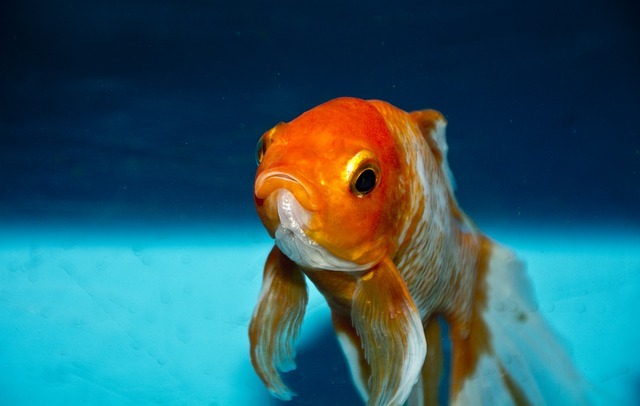 Even adult fish that have a hard time swimming are better off living in a tank with an air pump driven filter. One reason people add an air pump to their fish tank is to add a little visual appeal to their environment. A bubble wall or column of bubbles can add a dramatic effect to the inside of an aquarium. This effect then carries over to the room the tank is placed in by creating a mesmerizing display of shimmering lights for everyone to enjoy. 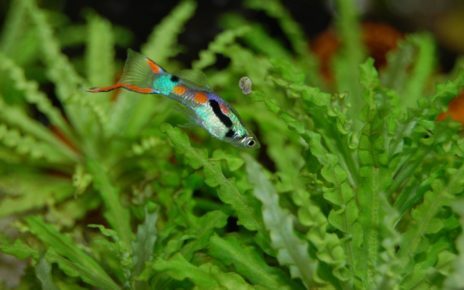 Some fish tank decorations rely on air to power their actions. Decorations like the old pirate treasure chest that opens up when there is enough air under its lid are one decoration that most people are familiar with. 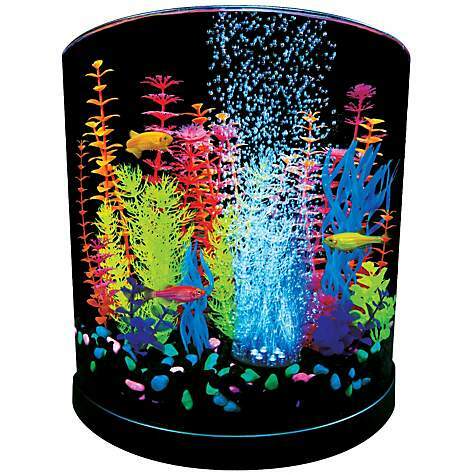 There are even more modern decorations like underwater lights that are driven by aquarium air pumps. These decorations use the force of the air to power small motors that can run low power LED lights. These lights can then shine up through the air bubbles, which creates a very dramatic effect especially at night when the main canopy lights are turned off. Air stones help increase the amount of surface area of air that comes into contact with the water. An air stone is usually made up of a porous material with lots of small holes for the air to escape from. By breaking up the air, an air stone allows for more gas exchange to occur which helps increase the effectiveness of the air pump. Air stones also help weigh down the air line so it doesn’t just float up to the surface of the water. While it might be possible to wedge an airline into an aquarium without an air stone it is usually not recommended. The large bubbles produced by an airline will also be less efficient at introducing dissolved oxygen into the water. The larger bubbles will also disturb the fish since they can cause large cavitation events to occur in the water. A 2.5 gallon tank will need an air pump with an output of 0.0825 liters/min. A planted 2.5 gallon tank will require and air pump with an output of 0.055 liters/min. A 2.5 gallon reef tank will need an air pump with an output of 0.103 liters/min. 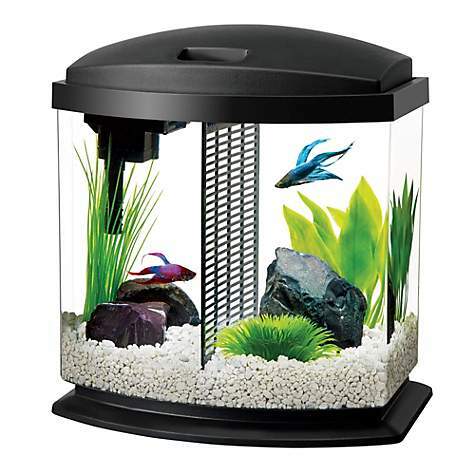 A 3 gallon fish tank will need an air pump that has an output of 0.099 liters/min. 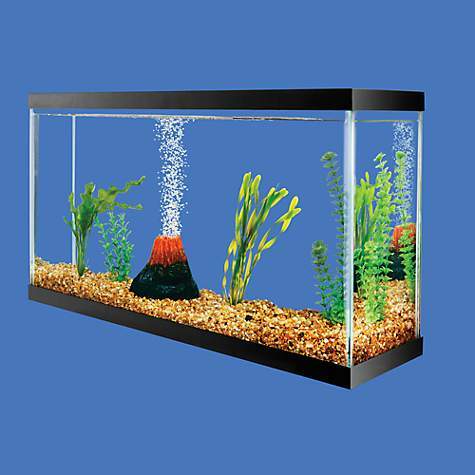 A planted 3 gallon fish tank will need an air pump that has an air output of 0.079 liters/min. 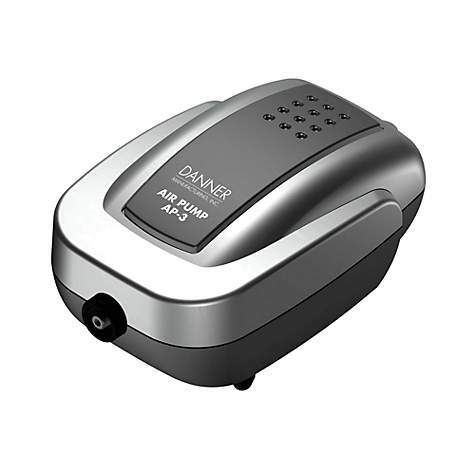 A 3 gallon saltwater tank will need and air pump with an output of 0.124 liters/min. A 5 gallon tank should use an air pump that can output 0.165 liters/min. 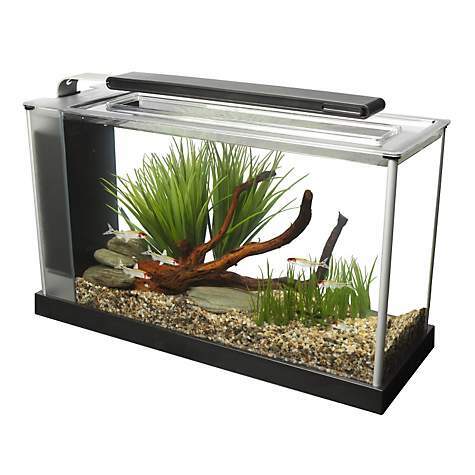 While a planted 5 gallon tank will need an air pump with an output of 0.132 liters/min. A 5 gallon saltwater reef tank will need an air pump that can output 0.206 liters/min. The right sized air pump for a 10 gallon tank is one that can output 0.33 liters/min. A planted 10 gallon tank will only need and air pump that can output 0.264 liters/min. While a 10 gallon saltwater reef tank will need an air pump with an output of 0.413 liters/min. 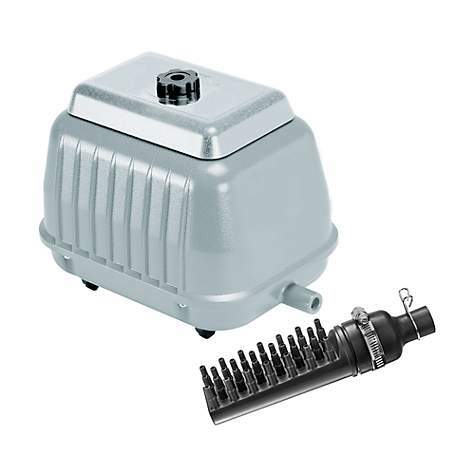 A good size air pump for a 30 gallon tank is one with an output of 0.99 liters/min. A 30 gallon planted tank should use an air pump with an output of 0.792 liters/min. A 30 gallon saltwater reef tank on the other hand will need to use an air pump with an output of 1.24 liters/min. The optimal size air pump for a 55 gallon aquarium is one that can output 1.82 liters/min. If you have a planted 55 gallon aquarium, then an air pump with an output of 1.45 liters/min will suffice. A 55 gallon saltwater aquarium will need an air pump with an output of 2.27 liters/min in order to properly oxygenate the water. The size of an air pump for a 75 gallon tank is one with an output of at least 2.48 liters/min. While a 75 gallon planted tank will only need an air pump with an output of 1.98 liters/min. A 75 gallon saltwater reef tank will need a more powerful air pump, therefore an air pump with an output of 3.09 liters/min will be the bare minimum. If you have a 100 gallon fish tank then you will need an air pump that has an output of at least 3.30 liters/min to oxygenate the water. A planted 100 gallon fish tank will need a slightly less powerful air pump. 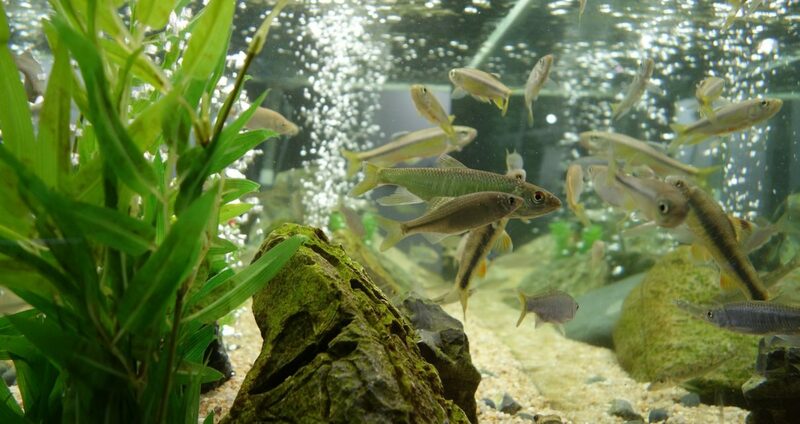 A planted 100 gallon tank will only need an air pump with an output of 2.64 liters/min. A 100 gallon saltwater reef tank on the other hand will need a powerful air pump with and output of 4.13 liters/min to keep the dissolved oxygen levels at the proper level. A large 200 gallon aquarium will need an equally large air pump to keep the tank well oxygenated. 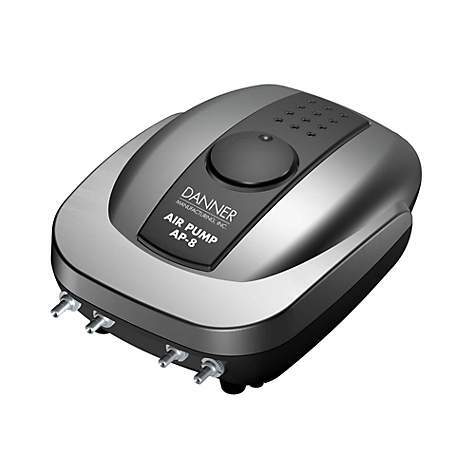 Therefore an air pump with a minimum output of 6.60 liters/min will be needed. A planted 200 gallon aquarium can use a slightly less powerful air pump, in that case an air pump with an output of 5.28 liters/min will be enough. A 200 gallon saltwater aquarium on the other hand will need an air pump that has an output of 8.25 liters/min in order to deliver enough oxygen to such a large body of water. If you are looking into getting and air pump the first question that might come to mind is do I really need an air pump in the first place. An air pump isn’t absolutely necessary, unless you’re using a filter that needs an air pump like an undergravel filter or a sponge filter. If you are using one of those filtration options then getting a properly sized air pump is mandatory. If you plan on using another method of filtration like a powerfilter or any other water pump driven filter then an air pump might not be necessary. In most cases the current created by most filters will agitate the water enough to help with gas diffusion. This is especially true of powerfilters or any other type of filter that causes a lot of splashing on the surface of the water. 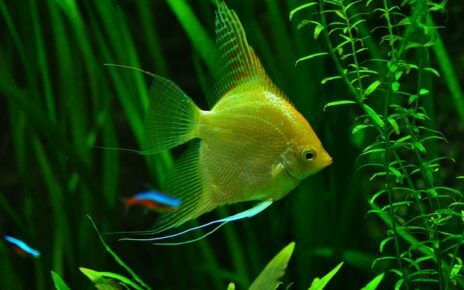 An air pump will be necessary if you have a densely stocked aquarium, or if the filter doesn’t have the power to sufficiently churn up the water. 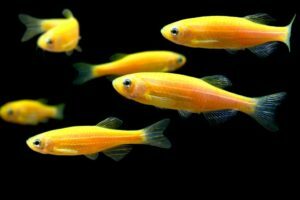 If you plan on keeping a densely stocked aquarium then the oxygen demands of the fish will require the use of supplemental aeration. A lack of water movement can also lead to dead spots where oxygen levels are too low for fish to remain healthy. 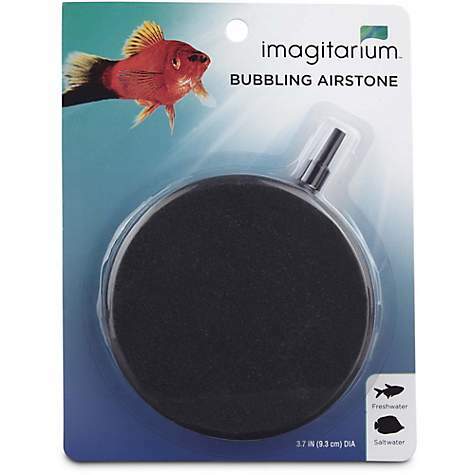 Adding air stones to those dead spots can help even out the aquariums dissolved oxygen level. There are two main types of aquarium pumps, one is the diaphragm pump and the other is the piston pump. A diaphragm air pump is the type most commonly used by people with small home aquariums. While the piston type is usually used in large commercial settings or in ponds with large volumes of water. Diaphragm air pumps move air by vibrating a membrane at a high frequency. The membrane is usually made of a soft flexible material like rubber, which can expand and contract to cause the pumping action. In most diaphragm air pumps a magnetic material is attached to the diaphragm, which is then moved by an induction coil. The induction coil creates an oscillating magnetic field at 60 HZ which is the frequency of the electric grid in America, or in Europe it will be 50 HZ. This oscillating magnetic field causes the magnetic material to push the diaphragm in and out. On the up stroke the diaphragm pulls air in through one valve via a small filtered inlet on the body of the pump. On the down stroke the diaphragm pushes the air out the outlet port right into the air line. This process is relatively efficient, and requires very few moving parts which is the main reason why it is used on most hobbyist equipment. Piston air pumps are more complicated mechanically, but they can output air at a higher power. The way they move air is similar to the way a car’s internal combustion engine works. A piston based air pump is just like a car’s engine where a piston moves up and down in an enclosed cylinder to create pressure. On the upstroke air is let in from the environment through a valve. The piston is then driven down closing the intake valve and compressing the air in the chamber. At the bottom of the stroke the outlet valve is opened and high pressure air is released from the cylinder. Piston air pumps have the advantage of being able to run at very high power, with some models available that run at more than one horsepower. They are also able to deliver air deeper into the water since they output higher pressure air than diaphragm pumps. And they tend to be more durable than diaphragm pumps which is another reason they are used in commercial applications.